The Zip-It tool is a wonderful little plumbing gadget that can be used to clean out a clog in a shower, tub, or sink; basically anywhere that collects a lot of hair. The tool is a little under 2 feet long. It’s made of plastic and has barbed notches pointing upward that catch onto the material that’s clogging the drain in the hopes that it can pull it out of your pipes. They can be purchased online from sites like amazon or in home improvement stores such as Home Depot, normally for less than $5. 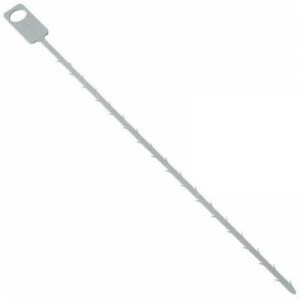 Start by inserting the Zip-It tool into the drain in question, whether that be your sink drain or your tub drain. This tool can be used as a means of performing regular maintenance on your house as much as it can be for clearing a clog. Make sure the tool is as far in the drain as possible. The only thing that should be left out of the drain is a little tab at the end which it is meant to be pulled from. Once you’ve pushed the tool down as far as it can go, you may want to wiggle it around and spin it all around the drain to make sure it catches as much gunk as possible. Then begin to pull the tool out. It may give a little resistance, that just means that you’ve caught a big one. Just keep pulling and tugging until you get the tool out of the drain. You may want to have a plastic bag nearby to wrap around the tool as you pull it out. That will provide for you a spot on the tool which you can pull from with the other hand (the one that isn’t on the tab). Multiple trials may be necessary to fully clear out the drain. After your first go, dispose of any residue in a garbage bag, clean off the tool with a rag, and go into the drain again. Repeat this process until you are certain there is no more hair setting in your drain. If you’ve followed these steps and your drain is still clogged, you may want to look into plunging the drain, snaking the line, or clearing out the p-trap manually.